His family's house has become a Halloween attraction on Main Street in Covington. Known for its over-the-top and elaborate display that seem to grow every year, the Webster house is a destination for looky-loos looking to be spooked. Last year, Grant Webster, 15, looked to cash in on the annual success -- but not for himself. His dad, Richard Webster, always looking to raise the bar for the Halloween display, scored a hearse and parked it out front. While cleaning it out, the family discovered a number of canned goods inside and a light bulb went off. "We decided we would fill it with canned goods," Grant said. The Helpful Hearse was born. 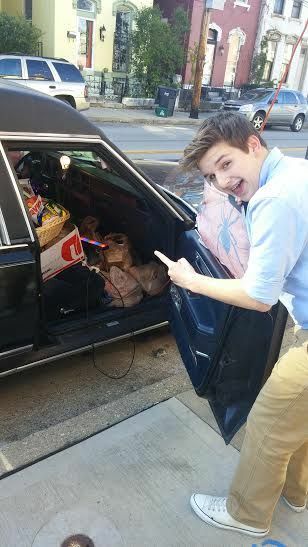 Grant, a sophomore at St. Henry District High School, encourages passersby to open the hearse's door and toss in a non-perishable donation. Last year, more than six hundred pounds of goods were tossed in the macabre vehicle, and all went to the Parish Kitchen. This year's beneficiary is Be Concerned. You can find The Helpful Hearse on the 800 block of Main Street in Mainstrasse Village (where mom, Bonnie, and sister, Grace, also live) and also visit its Facebook page.